When Jo VanEvery came to me asking if I would help create an illustration for her presentation in November, I was excited to draw something new. 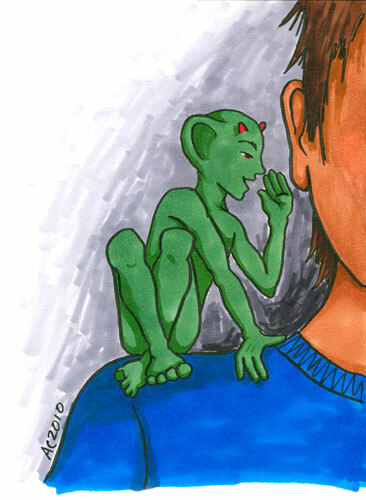 We went back and forth on just what a gremlin looked like, and we ended up with this little green guy whispering wicked self-doubt into the ear of his human. This naughty boy likes to undermine his human’s confidence and sow the seeds of indecision, especially in grad students. Since this is a commissioned piece, all rights are reserved, and it may not be reposted or reused anywhere, except by Jo, of course. Thanks!